Philadelphia Inquirer (March 1, 2017) – If weather and politics have your head in a muddle, perk up with the latest cheese report. There’s never been a better time to explore the spring outlook in terms of fresh curds and cheese boards. This is a splendid time to plan a road trip with dairy pit stops peppered along the way, and what better place to hash out your lactic vision quest than a ferment-centric watering hole like Martha (2113 E. York St.) in Kensington, which serves exclusively local cheeses on its boards. Since it opened last year, Martha has evolved into something of an exotic dairy clubhouse where people interested in urban cheesemaking and basement cave-aging can be found in conversation under the twinkling lights above the bar. Check out the Philadelphia cheese map from Culture Magazine (culturecheesemag.com), or visit the state cheesemaker map developed by the recently formed Pennsylvania Cheese Guild (pacheeseguild.org). If dairy-tripping isn’t your jam, you can always invite more milky goodness into your life by exploring the giant cheese wall at the new Center City Whole Foods, where half a dozen local cheeses are on display. Or sign up for a local cheese Community Supported Agriculture program this spring, like the one offered by Collective Creamery (collectivecreamery.com). 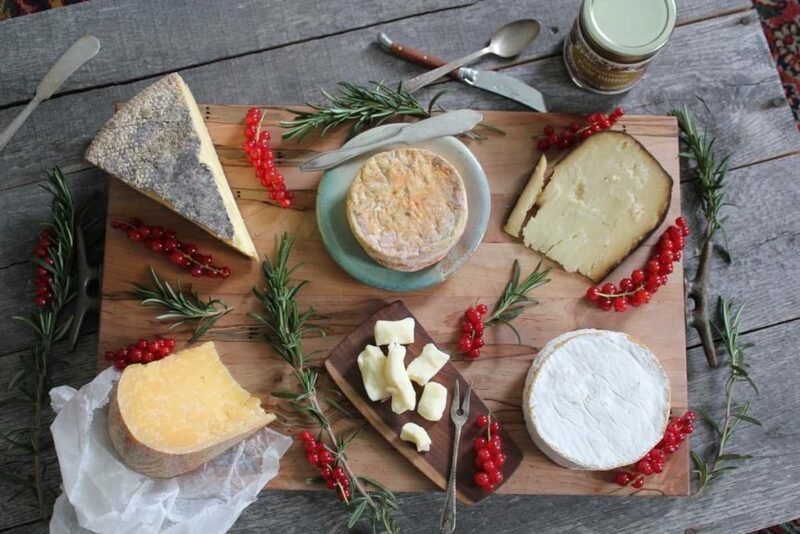 This new subscription-based venture maintains a slew of drop-off points around the city, and you’ll receive bimonthly handmade cheeses from two outstanding local makers, Sue Miller of Birchrun Hills Farm and Stefanie Angstadt of Valley Milkhouse Creamery. The two teamed up last year to expand their inventory and share exclusive collaborations — such as an all-local porcini mushroom Brie. Greensgrow Urban Farm and Yellow Springs Farm, in Chester County, also offer cheese CSA programs (Yellow Springs even has a goat yogurt CSA). For a taste of some of great wheels rolling out of our region, here’s your doldrums chaser. Belly up to this cheese board with some dark beers and hard ciders. For the first time, Sue Miller’s buttery squeakers are available in Philadelphia exclusively at Fox & Son Fancy Corndogs in Reading Terminal Market. The new stand is co-owned by Ezekial Ferguson, a longtime Philadelphia cheesemonger (Di Bruno Bros., Valley Shepherd) with a history of nurturing the local cheese scene. Twice a week, Miller delivers fresh curds from her farm in Chester County to Fox & Son, which serves them fresh or fried. Fans of cheese curds, prepare to swoon. Washed in Dad’s Hat Whiskey, this golden funk-bomb from cheesemaker Paul Lawler unleashes notes of walnut and melted onions. Made from pasteurized milk from the farm’s grass-fed herd of dairy cows, it pairs well with a wintry cocktail, like a Dad’s Hat old-fashioned or Manhattan — try using walnut bitters. Where to taste: The Cherry Grove Farm Shop, Fair Food Farmstand, High Street on Market. Cherry Grove Farm, Lawrenceville, N.J.; www.cherrygrovefarm.com. Bobolink hired a new herd manager and cheesemaker last spring, Fishtown resident Geoff Bucknum. Under his care, the rugged Jean Louis has become a swarthy staple on the cheese board at Martha, where it pairs beautifully with chef Tim Kirkland’s habanero jam. Try adding a pint of Ploughman’s Lupulin Lummox hard cider (made with Citra hops) to play off this cheese’s wild acidity and grassy notes. Where to taste: Martha, Fair Food Farmstand, Bobolink Dairy’s Farm Store. Bobolink Dairy, Milford, N.J.; www.cowsoutside.com. From the Pittsburgh area comes a line of raw-milk goat cheeses with some exceptionally interesting rubs and washes, like this espresso-encrusted beauty. No, this isn’t the only bean-to-rind cheese on the market, but it may be the best. The paste is sweet and full-flavored, which means the flavors in the milk outshine the bitterness of the coffee instead of getting trounced. Anyone hell-bent against “flavored” cheese (lo, I am in this camp) should rise up and run to the store. Pair this with a coffee stout and call it a night. Where to taste: Tria, Fair Food Farmstand. If you haven’t curled up by the fire with St. Malachi this winter, you’re missing out on one of the tastiest and most decorated cheeses from the area. St. Malachi won second place at the cheese Oscars (a.k.a. the American Cheese Society competition) last summer, and St. Malachi Reserve — a more aged version of this cheese — snagged a gold medal at the 2016 World Cheese Awards. If you like ultra-aged Gouda, you’ll love the rich butterscotch notes in this pasteurized prize-winner. Try pairing it with barley wine or fruity white. Where to taste: Di Bruno Bros., Talula’s Daily, Weaver’s Way, Swarthmore Co-op, Fair Food Farmstand. One bite of Stefanie Angstadt’s luxurious local Camembert can offset despair, or at least leave a lasting impression. At 30, Angstadt is one of the newest phenoms on the regional cheese scene. Her French-inspired cheeses are named after wildflowers from the Oley Valley, where she lives. Enjoy them, and think spring. Where to taste: Fair Food Farmstand, Weaver’s Way, Di Bruno Bros., Talula’s Daily. Cheese & Beer Pairings at Brewer’s Plate, 6 p.m. March 5, Kimmel Center, www.brewersplate.com. Note: look for the collaboration between local Caputo Bros. Creamery and Sam Adams. 2nd Annual Curd Convention at Philly Farm & Food Fest, 10 a.m.-4 p.m. April 8, Convention Center, www.phillyfarmfest.org.